A busy stretch of motorway that cuts across a swathe of central England could be off limits for 24 hours when it closes at the weekend. From 20:00 on Saturday, the M6 will shut both ways between junctions 14 and 15 in Staffordshire for at least 12 hours but drivers are warned it could be double that. 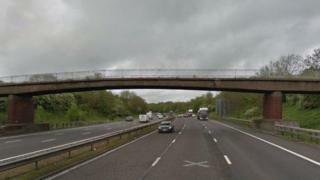 Highways England says it is to allow the demolition and removal of a 250ft, 150-tonne bridge. It spans the M6 north of junction 14. The affected stretch of motorway is a key north-south route for thousands of drivers and Highways England says they will be informed of the closure on roads as far away as Dover and Carlisle. Motorists and hauliers travelling between the North West, the Midlands and the south of England will be urged to avoid the area by using the M62 and M1, but they have been told to expect delays. Diversion routes are set to be signposted. Creswell Home Farm bridge, Highways England says, is no longer in use and also too narrow to allow planned upgrades to the motorway which will see an extra lane in each direction as part of a wider improvement programme between junctions 13 and 15, estimated to cost up to £335.4m. A statement said: "We cannot demolish the bridge safely with traffic using the M6; therefore we must close the motorway. "The demolition could take up to 24 hours, however we are hoping to complete the work in 12 hours. Our workforce will be working as hard as they can to open the road as soon as it is safe to do so." Highways England says it is working with emergency services to make sure they can maintain provision amid the work.